Karen Silver Multigem Beaded Wrap Bracelet from Thailand, "Earthen Blend"
An earthen blend of agate, jasper, and black onyx glisten in the bold design of this wrap bracelet. Thailand's Siriporn crafts the bracelet by hand with adjustable brown leather cord to complement her rich palette of enhanced gem colors. A button of silver handcrafted by Karen hill tribe silversmiths closes the bracelet. 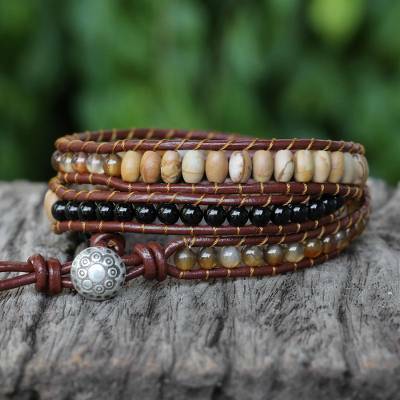 You can find multi-gemstone wrap bracelet 'Earthen Blend' by Siriporn in jewelry categories such as Hill Tribe Bracelets, Birthstone Bracelets, Agate Bracelets, Onyx Bracelets, Multigem Bracelets, Jasper Bracelets, Leather Bracelets, Silver Bracelets, Fine Silver Bracelets, Beaded Bracelets and Wrap Bracelets. Enjoy exploring these sections for other Novica treasures. Siriporn has two assistants from a local village. Siriporn has received 6 microcredit loans with 0% interest from Kiva and Novica, the first for $850 and the most recent for $2850. Beautifully made & wonderful design. Needed a nice bracelet to wear with brown, beige, green and other neutral colors. This one is perfect! Love, love, love this artist and her work!! Will be purchasing many more items in the future! !